HISTORY: The Saguache Ranger Station was constructed in 1939 to serve as a ranger residence, office and garage. 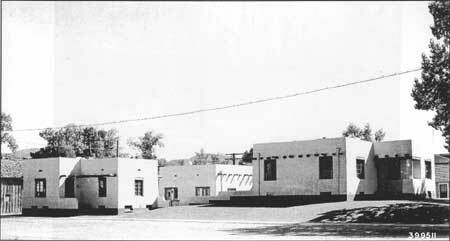 Assisted by the Civilian Conservation Corps, the United States Forest Service (USFS) designed and built this Pueblo-style complex. The complex is described as "the best preserved representative of a Pueblo-style complex, as well as one of the best preserved CCC-era Region 2 urban ranger stations in Colorado" (source). Currently, the Ranger's residence and garage are still in use as constructed while the office has been converted to a bunkhouse to serve seasonal USFS employees. The bunkhouse's vigas, or log beams, are an interesting and iconic element of southwestern architecture. The popular style has been imitated in modern architecture as well, primarily for decorative purposes. The vigas we will work on support the bunkhouse structurally, and over time have deteriorated. Help us repair them so this building can continue to serve the public! HistoriCorps was especially excited to return to the Saguache Ranger Station, as it was the site of our very first preservation project in October 2009! LODGING: We stayed at the Upper Crossing Guard Station, which is a lovely historic rental cabin managed by the Forest Service. It was 25 minutes' drive from the jobsite. AREA TOURISM: Saguache, CO is rural Colorado at its best. Lovely vistas surround the town, and it's a pleasure to drive or bicycle the area's small roads winding through mountain ranges. Saguache is only an hour's drive from Great Sand Dunes National Park as well.